The White House filed papers on Wednesday morning asking that CNN's request for a temporary restraining order be denied. 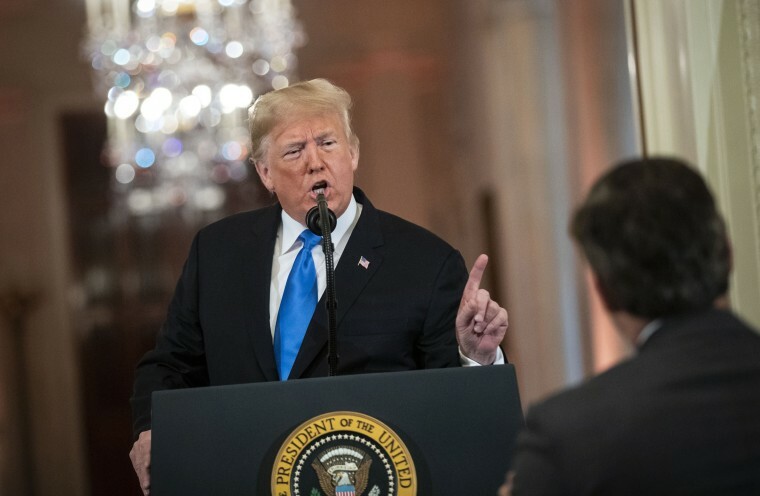 The White House went to federal court Wednesday to defend its right to revoke the press pass of CNN's Jim Acosta, arguing that President Donald Trump's authority to grant interviews and press access meant he did not violate the journalist's First Amendment or due-process rights. The White House was responding to a lawsuit filed on Tuesday by CNN in U.S. District Court in Washington, and asked the court to deny CNN's request for a temporary restraining order. CNN had sought the order to recover Acosta's "hard pass," which granted him access to the White House. Justice Department lawyers including Joseph Hunt, the assistant attorney general in charge of the department's civil division, submitted the filing Wednesday morning, hours before a 3:30 p.m. ET hearing on the lawsuits. "The President and White House possess the same broad discretion to regulate access to the White House for journalists (and other members of the public) that they possess to select which journalists receive interviews, or which journalists they acknowledge at press conferences," the filing says. At Wednesday's hearing, Judge Timothy J. Kelly did not issue a decision on the restraining order and said he would return at 3 p.m. ET on Thursday with a ruling. Acosta, CNN's chief White House correspondent, was denied access to the White House on Nov. 7, hours after Trump verbally berated him as a "rude, terrible person." Acosta at a news conference had questioned Trump about a group of migrants traveling north toward the U.S.-Mexico border and entered into a contentious exchange with the president and refused to give up a microphone when the president tried to move to a different reporter. CNN sued, saying that Acosta's rights had been violated and that the network wanted to "ensure that the press remains free to question the government and to report the business of the nation to the American people." In Wednesday's filing, the Justice Department argued that Acosta's actions provided the White House with a clear reason to revoke his hard pass. "The stated rationale for the revocation of Mr. Acosta’s pass — that he was disrupting press proceedings — is evident from the video he has proffered, is entirely viewpoint- and content-neutral," the filing says. The Justice Department also argued that Acosta was still able to do his job and that CNN has "roughly 50 other employees who retain hard passes and who are more than capable of covering the White House complex." Media outlets have broadly supported CNN's lawsuit. Ballard Spahr, a law firm representing a large group of media organizations including Fox News, The New York Times, The Washington Post, The Associated Press, Bloomberg and NBC News, said it would be filing briefs in support of the CNN lawsuit. "Whether the news of the day concerns national security, the economy, or the environment, reporters covering the White House must remain free to ask questions," the firm said in a statement. "It is imperative that independent journalists have access to the President and his activities, and that journalists are not barred for arbitrary reasons."